14 pages | 1 B/W Illus. Nicholas Georgescu-Roegen's (1906-94) most original contribution is his bioeconomic theory. Based on a profound rethinking of the foundations of neoclassical economics, bioeconomics represents a completely new paradigm compared to both the standard and the Marxist approach. Opening economics to natural sciences led Georgescu-Roegen to point out the bio-physical limits to growth. In the last years of his life, he also criticised the sustainable development paradigm, but his criticism disappeared together with him, only to re-emerge recently, thanks to the research on his archiveand to the interest for his viewpoints within the framework of 'degrowth'. 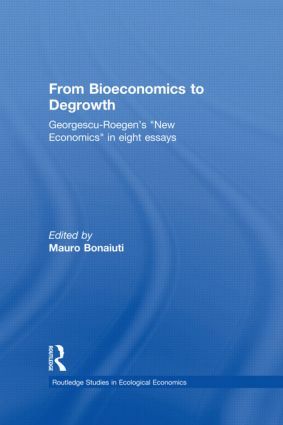 In his last years Georgescu-Roegen intended to publish a text entitled Bioeconomics, as an initial systematic arrangement of this doctrine. This book aims to pick up that project in two ways: first, collecting Goergescu-Roegen’s main contributions to bioeconomic theory, some still unpublished, and tackling the principal nubs of the discipline particularly the criticism of sustainable development. Second, recuperating that full multidisciplinarity that represents the profoundest characteristic of the bioeconomic theory. The concluding essay is now considered a cornerstone of the degrowth perspective. Mauro Bonaiuti is one of the first scholars to devote his research to the field of sustainable degrowth and is also considered one of the major experts on Georgescu-Roegen. At present he is teaching at the University of Turin, Italy.